Create a new application and save the unit as uGreetUser.pas and the project as GreetUser.dpr. Open the form and add a label (tool-tip TLabel ) and button (tool-tip TButton) from the Standard tab of components and a labelled edit (tool-tip TLabeledEdit) from the Additional tab. 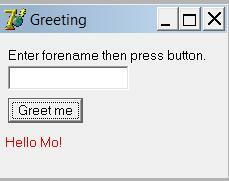 Rename the components by changing in the Object Inspector the Name properties of the form, label, button and labelled edit to frmGreeting, lblGreeting, btnGreeting and leForename, respectively. Using the Object Inspector, change the Caption property of the form, label, and button to Greeting, blank (by deleting the contents), and Greet me, respectively. Using the Object Inspector for the labelled edit, click on the + to the left of EditLabel then change the caption of the EditLabel to Enter forename then press button. Resize the form and position the components to your satisfaction.